How Reliable is Horse Racing Form For Your Bank Balance? Experienced punters won’t even consider making a selection in any given horse race without careful study of the form guide. It is Betting 101! Each horse in the race receives a rating based on past performances with its last run the one that increases or decreases its Official Rating (OR). Conventional wisdom states that the more time you spend studying the form, the more successful you’ll become. However, this is horse racing we’re talking about! So it isn’t as simple as looking at previous results; the key is to dig deeper and find some meaning in the form. More pertinently, you must compare the form of your selection against its rivals in the race. Raceform provides an official guide, but there are free guides available in online publications such as the Racing Post. You can even check recent form on betting websites such as Betfair. 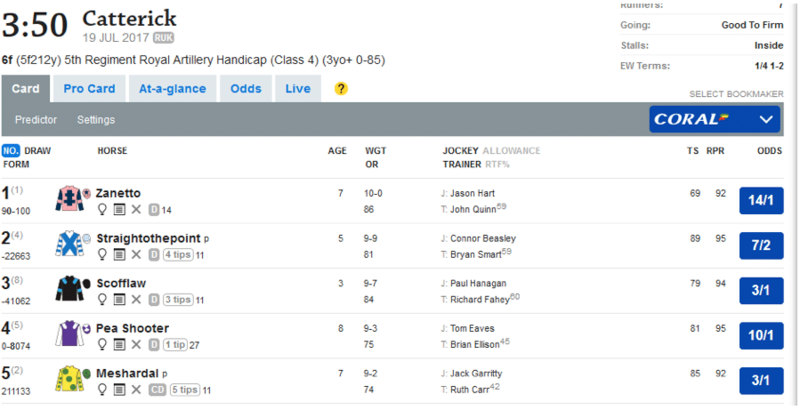 The above is a racing card taken from the Racing Post website. You can see the form is on the left-hand side of the picture. The site shows up to the last six results of each entrant, and the most recent result is on the right. So for Zanetto, his most recent run is ‘0’. In horse racing terms, this means the horse finished 10th or worse in his last race. His second last race is also a ‘0,’ but his third last race was a win. On paper, Meshardal looks a much better proposition because his last six races have seen him finish third twice, second once and he has three wins. The thing is, taking a horse’s recent form at face value is risky business because there is a chance that it is in decline despite posting nice looking recent results. Then there is the small matter of Class. A horse may do well in Class 5 races, but if today’s race is a Class 4 event, you need to think twice. The above is a Flat race, but if you see a figure in bold on a horse’s form guide, it means the race took place on an All-Weather track which often bears no relation to how it will perform on turf. There are a number of other things to consider when looking at a racing card and I may revisit the subject in a later piece. However, today I want to show you how to go beneath the veneer of form to find value. It is all too easy to discount a horse because of recent bad results, but you don’t know the full story unless you do your research. A horse may have had a poor break from the stalls, got caught up in the pack or a jockey made a mistake in its last race. Likewise, a horse may have got lucky last time out when one of its rivals made a blunder. It is always a good idea to watch one of your possible selections in its last race to see what happened. Maybe it finished fourth, a length or two off the pace but was gathering speed by the end. If the horse in question is going up in trip, the extra furlong might be exactly what it needs. Perhaps the biggest indication of a horse in contention is whether or not it is on an upward curve. A horse could record nice looking results, but if its official rating is falling, it is probably best avoided. Finally, you have to consider the quality of previous races against today’s race. Let’s take a closer look at 14/1 shot Zanetto. At first glance, he looks like a desperate no-hoper as he has finished ninth or worse in five of his last six races. However, they were all Class 2 or 3 races, and his other race was a win in Class 4 Company. This race is a Class 4 event. He is also running at his second lowest OR since 2012; the only time he was lower was when he won the race three outings ago. Suddenly, our 14/1 shot looks more interesting; but wait! Zanetto is carrying nine pounds more compared to that victory. Also, his OR has been in decline for some time (he had an OR of over 100 at one stage) so once again, his 14/1 price tag looks about right. Of its rivals, Meshardal is a pound lighter than his last Class 4 win, but that was against lower level opponents. Straighttothepoint is 8 pounds heavier than its last Class 4 (which was 12 races ago), Love Oasis has two recent wins but both at Class 5 and Scofflaw won recently, but it was a Class 5 event. In this race, you could make an argument against any of the horses. (For the record, Zanetto faded badly in the race and finished 7th showing why he was an outsider in the first place). The final step is to take a look at some statistical analysis involving horses and recent form. Let’s take a quick look at horses that have performed well in their last 3 races. These figures only serve to underline what experienced punters already know: You can’t look at any individual result as an indicator of what’s to come. However, even horses placed in each of their last three races don’t fare well for the punter with an ROI loss of 8.74%. When you look at horses that achieved its placings in Class 6 races, you make a very small profit of 0.25%. It’s OR compared to the rest of the field. Whether or not the horse is likely to be on an upward trajectory. The Class of race compared to previous races. The weight it is carrying. And on it goes. After all, if it were as easy as analysing a few figures, the bookmaking industry wouldn’t last long!